Ever Met Snake Tongue Orchid? A sage family member shared, years ago, that grandchildren, for those fortunate enough to enjoy them, were “dividends.” He got that right. Application to butterflies and wildflowers? 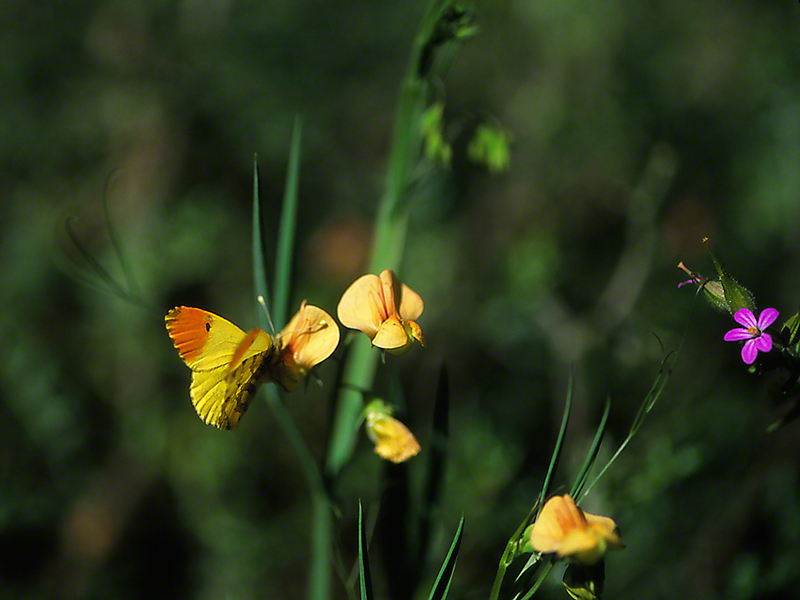 Seeking butterflies in the field (wild) often produces a very beautiful treat, wildflowers. Wildflowers that you didn’t expect or know you would see. Here, 7,000 miles from Pittsburgh International Airport (USA) I was seeking butterflies, and then . . . I saw these orchids. What? OMG! Excuse Me! And what do we have here? These, all thoughts that shot through my mind. I was 50 yards from the Mediterranean Sea, in Rosh Hanikra National Park, Israel. At the northwestern tip of Israel, with the border with Lebanon in sight. That border with its own bloom of towers, disks, and other esoteric security gear. But down here, 450 feet from the border, I was meeting a new orchid, the Snake Tongue Orchid. Rare, protected and very extraordinary looking. I worked about a mile of the Park, all hugging the shore of that blue-green sea. I worked it slowly and thoroughly. 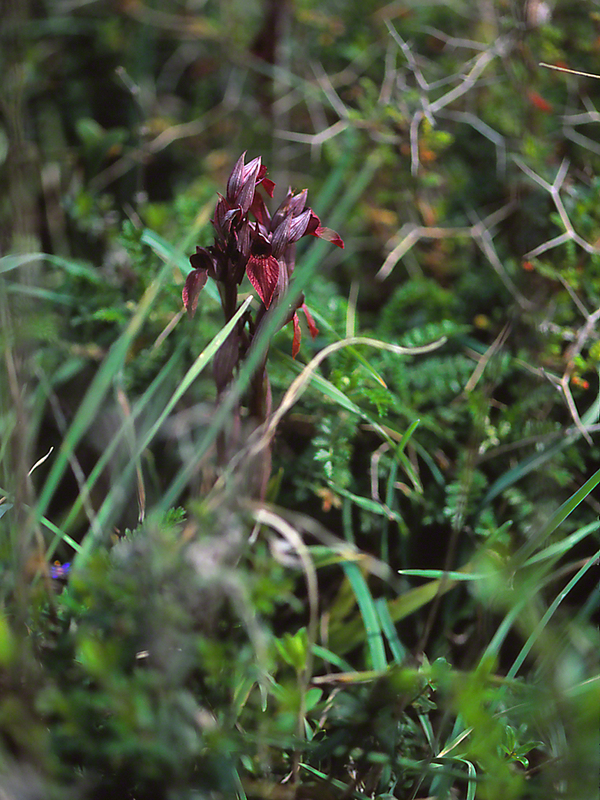 I saw approximately 35 of these orchids (Serapias Vomeracea). They were in small groups, plants usually 3-4 feet apart. Their color made them stand out like a sore thumb. I looked at the dozens and dozens of tourists (Israeli, Chilean, Belgian, German, Canadian, Azbekistanian, and more), and thought what folks like us think. Why were 99.8% of us not stopping, getting out of their cars, and coming over to gaze at these fabulous orchids, limited bloom-time, and in very, very limited numbers? For those of you who have not visited Israel, and imagine it as war-ravaged, paranoid, stressed and rocky barren . . . well, no, you ought to visit the HolyLand, for as you see, it it Beautiful. I know to give alot of room, when identifying Crescents in the field. 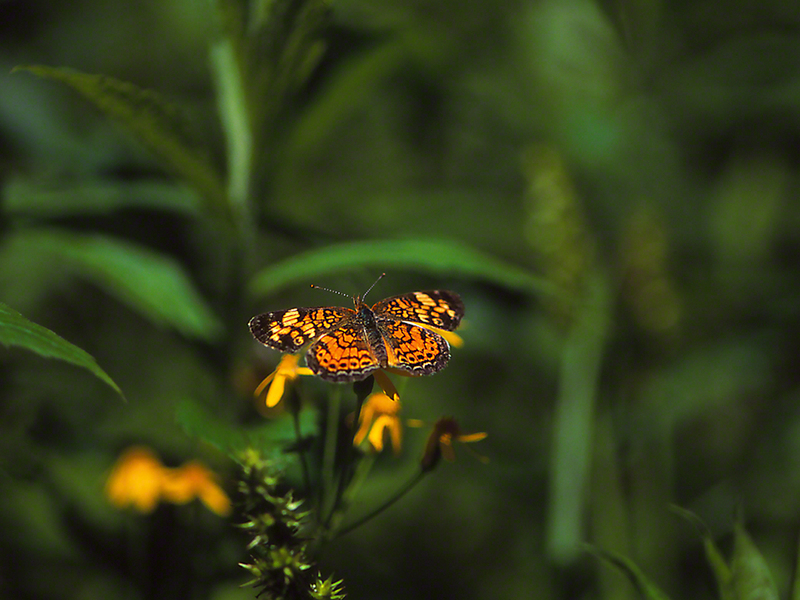 Pearl Crescent butterflies (Phyciodes Tharos) vary from individual to individual, and can give you fits, because some are so variable, enough to tempt you to think that you have found a unique one. Have a look at this female. She was nectaring in the reserve meadow at the Jamestown Audubon Center in Jamestown, New York. It’s those mid-forewing bands that triggered my curiosity. Yellower than I’ve ever seen, they reminded me of Phaon crescents, though I know that they fly hundreds of miles south of Western New York. When I turn the page in Butterflies of the East Coast, our girl starts looking a bit like a female Tawny Crescent, at least to me. Well Jamestown was once their range, but Cech and Tudor sadly note that Tawnys have disappeared from western New York post-1970’s. So there you have it, Crescents are very handsome butterflies, but one must allow for a great deal of variation, and it’s a whole lot easier if you are well-schooled in identifying these winged beauties. Multiple goals for my March 2015 visit to Israel. Visit my infant grandsons, savor the seas of wildflowers that usually follow wet winters, and introduce myself to rare, endangered Middle Eastern butterflies. All goals were achieved, I am happy to share. Add to those, rental car good (Hertz), good stays in field houses (SPNI) and lots of friendly Israelis. 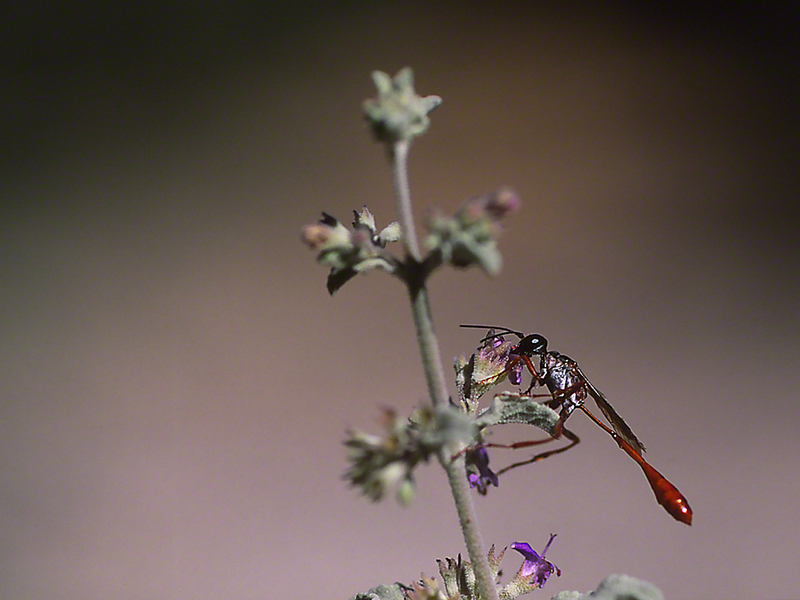 Shooting down the trail in northernmost Upper Galilee region, this Anthocharis Damone Syra took this nectar break, and I was right there to record the moment. Resplendent in vivid yellow, orange and black, he sipped long enough for me to shoot and shoot many photographs. His lower wing surface can also be seen, with its marbled green and yellow hindwing. Their flight time is short, they are protected because they are found in limited habitat, at the upper reaches of Israel. If their range extends across the border to Lebanon, we will not know, for which of you will travel through Southern Lebanon, currently generously sprinkled with terrorist cells? Before you move on, take another moment and look at the pinkish bloom to the right, nice, no? The ID of the flowers, that will require some feedback from friends there. Jake’s Rocks in Northwestern Pennsylvania was another treasure trove of Pink Lady’s Slipper Orchids, and a teaser with orchids that were no longer in bloom (Oh, if I’d only been there a few weeks before). Here you savor the riches of a northeastern state that cherishes its land, and works hard to conserve critical habitat, including almost bewildering fields of godzilla-sized rocks here at Jake’s Rocks. Hiking through the moderately wooded Reserve, I met this rock. Now Jake’s Rocks has lots of huge boulders, left when the glaciers carried them there. 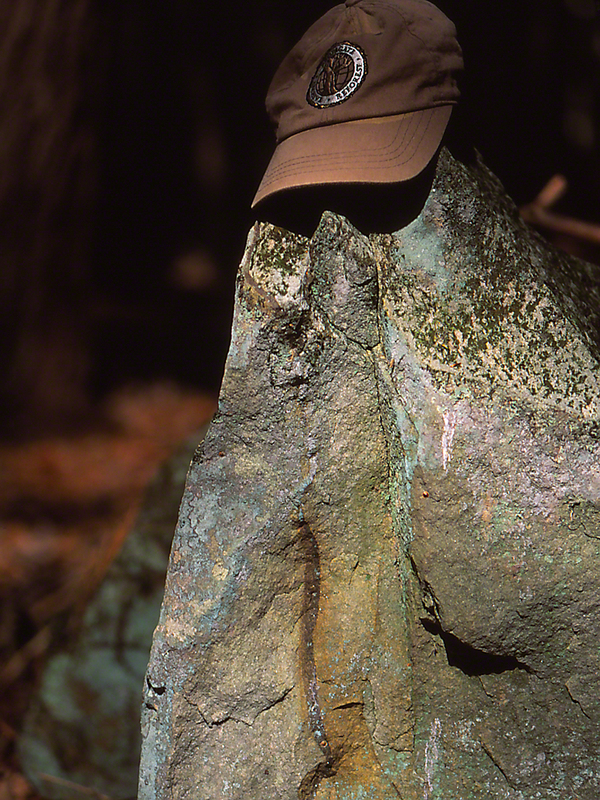 Then there was this whimsical boulder, tinier than the other monster ones, and, some out of character, I set my field hat on it, and am now sharing it with y’all. Whimsy in the field. Yes?